Netflix binge all day every day! Nobody likes getting tangled up in a mess of wires – the tech industry knows it, and the wireless charging market has increased by over two billion dollars since 2012 as buyers seek out convenient charging options for their portable devices. Now Logitech and Apple have teamed up to create a new wireless smartphone charger, called Powered, for the iPhone 8, iPhone 8 Plus, and the iPhone X. Supporting 7.5W of power, the new charger will allow you to charge your phone faster than ever before. 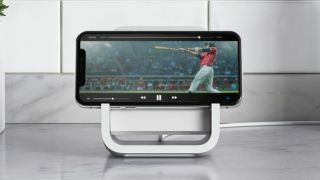 Although there are a number of wireless chargers on the market for iPhone users, the Powered is unique in that it holds your iPhone in its sleek, unmistakably ‘Apple’ cradle, which allows the phone to charge in both portrait and landscape mode. Crucially, this means it’s possible to carry on watching movies or videos on your iPhone while it charges in the secure stand – perfect if you need to catch up on the latest episode of Queer Eye on your morning commute. There’s also a handy light on the back to let you know your iPhone is actually charging. While this all sounds very convenient, the Powered relies on a proprietary charging cable which can’t be disconnected from the charger, meaning you have less flexibility should you require something a little longer than what’s included. Apple’s upcoming AirPower charging mat has been met with numerous delays – the latest word is that it will be available in September. However the launch of the Powered is unlikely to affect the AirPower’s sales, as the latter is aimed at people who have multiple Apple devices – users will be able to charge their iPhone, Apple Watch 3, and AirPods in one go, with the devices able to communicate and manage power consumption between them. If you’re set on being able to watch movies as you charge, the Powered will be available in late August and will set you back $70 (£60 / 94 AUD).